Reviewed by Diana Diaz. Viewed at the SBIFF 2018. In The Insult, a personal dispute and personal violence explodes into a national sensation, opening old wounds between Lebanese Christians and Palestinian refugees.The film’s prologue places Tony (Adel Karam) at a rally for a Lebanese christian political party with national flags flying. The narrative proper starts with an illegal drain pipe and a spray of water which falls on Yasser (Lamel El Basha). When Yasser fixes the open pipe, Tony destroys it. When Yasser goes to apologize, Tony baits him snarling along with the nationalist leader he’s been watching, “I wish Ariel Sharon had wiped all of you out.” One insult leads to another. Yasser socks him in the gut, breaking a rib. In the process of dragging their complaint through the court system, they ignite a powder keg of controversy, risk losing everything, cause their wives to suffer, and tear the country asunder when all they really want from each other is an apology. Even the lawyers turn out to have some personal skin in the game. In the process, Tony and Yasser learn they aren’t so different from each other after all. This film serves as a lesson that hate can easily get out of control. Courtroom dramas, take some liberties with real court processes with surprise evidence that changes everything at the last minute. While the Lebanese court system certainly has some variations in their laws compared to the US court system, this particular moment of “evidence” actually sheds light on a character’s background and motivations. Real court is really boring and involves a lot of paperwork. But what really makes this film work is the casting and the acting. Even if Lebanon isn’t exactly known for its film industry, the actors have all done stage work. Rita Hayek as Tony’s wife Shirine knows her way around the camera, and delivers a particularly affecting performance. And Yasser’s wife, Manal is the picture of longsuffering patience. And the men at each others throats give their performances a totally committed schoolboy zeal. Douieri, who co-wrote and directed the film, served as camera operator for Pulp Fiction (Quentin Tarantino, 1994) and Jackie Brown (Quentin Tarantino, 1997). Armed with what he learned in Hollywood, he returned to Lebanon and transformed into writer/director auteur of 3 features prior to The Insult. It is The Insult which garnered him and the cast with multiple honors at festivals and a nomination for Best Foreign Language Film at this year’s Oscars. As I went to Youtube and watched the trailer of The Insult, I finally realized that all I know about movies is so limited and trivial. Before I take Film Study 101, my stereotype of movies is classical Hollywood style. Now even though Hollywood is still the leader in global film industry, I learned that there are a lot of excellent international films we should acknowledge and admire. I believe The Insult director Ziad Doueiri uses classical Hollywood narrative method based on trailer I have seen. But different from Hollywood movies, many distinguished elements are added into this movie. Middle East is always full of controversy and conflict. The causes such as religion, petroleum and water source lead to the fact that billion people in that area suffer from war and death. This movie is not just about hatred or apology. Implicitly it is discussing a human nature. One dark side of human nature is that we always judge others. Color, religion, politics, nationality. these sensitive topics are revealed in this movie. “The Insult” by Ziad Doueiri, 2017) Lebanon. I love the story of the film because it has many social themes that can be related to how we interact with other people. For example, the arguments we have with our families and how they can easily scaled tone. Also, it illustrates why words matter and how they can have an impact on an entire country; whether to create wars or create peace. Moreover, films like this one can create awareness about other cultures and learn how they can be used as a source of information. In addition, as more none narratives movies are filmed they can start to be more compelling to the public. The plot and lesson from this film really relates to today’s issues. Hate can lead to so many unnecessary actions and end up hurting more people. 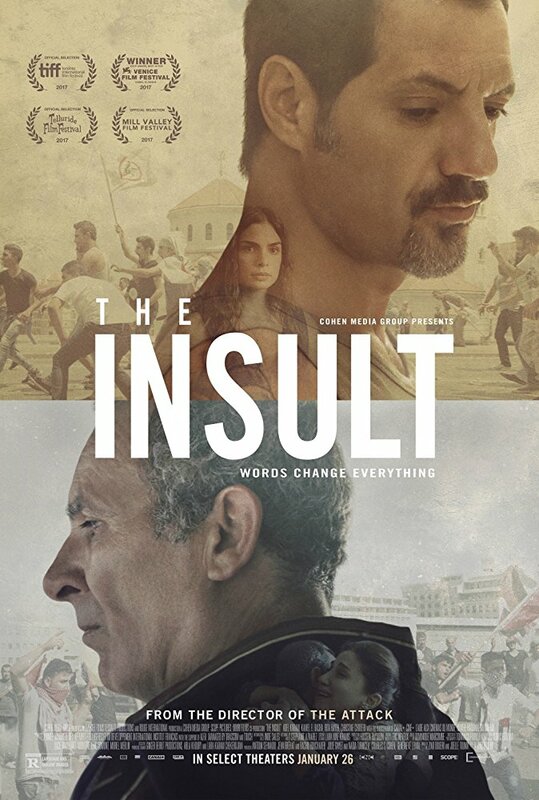 The world we live in now can have so many problems be solved by forgiving people and this film shows that lesson in how something so small as an insult can turn into such a big fight. Both of the main characters were very stubborn and persistent in getting not only an apology but the other guy saying that they were wrong. Sometimes being the bigger person and just apologizing will solve so many problems and stop any further actions from occurring. I have personally never seen this film. After reading your comments regarding it, it is definitely something that I would like to get around watching. I seem a little confused about the plot line. It seems like a very interesting story and doesn’t sound like movies we have watched during this course. I like how you commented on the acting, seems like it would be a stellar film if the acting is top notch. Nice film review. It seems like a very interesting film that I would like to see sometime soon. I am a little confused by the plot line, but it seems like a film packed with engaging challenges that the Palestinian refugees and Lebanese Christians had to face with their political issues. It is true how much the acting and casting can affect the design and message of the movie. It seems appropriate that they would use true Lebanese actors that have had plenty of screen time before. Its fascinating that the director formed his knowledge in Hollywood and took it to make a film in Lebanon. The art of film is so diverse throughout all cultures. Previous to reading the review, I watched the trailer of the film and still remained a bit confused about what the film was clearly about. After reading the review, the title of the film and the trailer made sense. The film seems very interesting and I believe films are one of the best ways to shine light on problems going around the world. From the trailer and review, this film focuses on the idea that insults and hate can lead to much larger problems. In particular, the film explicitly shows how some harsh words led to a war and larger division between Lebanese Christians and Palestinian refugees. The review elaborated on the plot of the film and made it clear if the trailer seemed confusing, which it did to me. This review by Diana Diaz on Ziad Doueiri’s The Insult (2017) is very thorough and provides many details on the plot of the film. Diaz explains the film’s historical relevance as well as the significance of Doueiri’s former roles in Hollywood productions, specifically Quentin Tarantino’s Pulp Fiction and Jackie Brown. The experience allowed Doueiri to bring additional insight into the film industry in Lebanon, which is not as renowned as Hollywood. Furthermore, Diaz comments on the difference between how court is depicted in films versus the reality that court involves heavy paperwork and often unexciting administrative duties. Although the review is descriptive there are very little aspects that relate to topics in our course, besides production. I enjoyed reading both of her reviews. This review by Diana Diaz of The Insult is thorough and provides a solid insight onto the movie. The structure of the review from the start gives us a nice outline of what to expect fro the writer. But what I thought was most interesting in the review was Diana Diaz’s take on the casting and acting of a movie. I often think this key aspect of film is vital to the overall success and can “make or break,” the production. In the film, Shirine played by Rita Hayek was cast nicely. There are couple other main-stream female actresses such as Michelle Rodriguez that could have fit the role well. However due to Hayek’s less popular past than of Rodriguez’s, I wasn’t given a chance to imagine one of the main character’s also taking part in a Fast and Furious movie. I’ve never heard or watched this film prior to reading this review. Although, I think compared to the other film review that I commented on, personally, I don’t think this one is as interesting. The film seems interesting just from the basic review, but I truly feel that this review didn’t really push me to grow a wanting to go watch this film. I’m sure there is a lot of cultural history in this film but it really didn’t grab my attention. Although, I did enjoy that he brought up how different the foreign court rooms and how different they are compared to the U.S. court rooms are. Overall, its an ok review but nothing really catches my eye. I haven’t seen or even heard about many foreign films but this was very interesting to get a new insight on. After watching the trailer and reading the review I was a little confused. I read that you mentioned that the main message of the movie was “that hate can easily get out of control.” We don’t see many plots or storylines like this in the U.S. film industry, which made it a little confusing for me to understand the concept of this film. This film review opened my eyes to a new kind of film that I never got a chance to get into before. This review makes me want to watch this film seeing that it has great acting in it. Intriguing film review! I’ve never see the film The Insult, but just by reading the review the movie seems impressive and entertaining. The trailer is a little hard to follow, but after engaging in this review I get a better understanding of the movie. The plot argues human nature and how hate can get out of proportion. This is a movie I will be looking forward to watching. Very well done film review. I personally have not seen or even hear of this film, based you your review of it it seems to be somewhat of an education movie about old problems that happened with the Lebanese Christians and Palestinian refugees, but it makes me at least want to watch the trailer and maybe a few minutes of the movie. The Insult (2017) has become one of my favorite films and it is because of the superb acting and the message behind the whole movie. Even though I had to read the subtitles the actors showed off such emotion with every argument, violence, and their struggles that it was very conveying and it grasped my full attention. My favorite scene from the film is when Tony is having a nightmare from his past and low key lighting with the shadows of the window causing a jail like presence as he is entrapped in his own memories. It was very powerful scene because shortly after he goes to his shop and suddenly passes out causing his wife to deliver early. Doueiri is a magnificent director and him learning from Hollywood and bringing it back to his country just shows off his resilience to succeed and his creativity for story telling. It reminds me of Hollywood in the earlier years when they recruited european directors to showcase different artistry than we’re accustomed to and he did just that for his country. He learned/studied in a foreign country and used his talent to share a strong impactful story to his people and the world. I have seen the foreign film The Insult and I do believe that Diana Diaz did a great review on the film, she is true on what she wrote. I do not truly appreciate this film because I do believe that the Cinematography and that quality of the of the footage where not the best. I believe it was missing the harmony of the story in the fact that there would continuously be something off in every single shot that was taken, I just never saw that perfect scene in the film. Besides that the film had a great social conflict that grabs the viewers in even if they are not aware of the conflict in that country. I have never really been into foreign films, but your analysis of this movie makes me interested to watch it. I think it would be interesting to see how actors in different countries perform and to compare it to how movies in the U.S. are made. From your review they seem to be made differently so it will be a good experience for me to see this movie to get my own opinion! Great review! I watched The Insult recently, and I agree that it is a simple story that is propped up by outstanding acting. This movie operates on the premise of conflict in Lebanon between Native Lebanese and the refugee Pakistani, and the movie does an good job portraying the natural animosity towards the Pakistani. As the judge in the movie indicated, the issue between the two was deeper than a drain pipe. This movie is a good representation of the animosity “landless” people experience living in other countries, and this movie is just the tip of the iceberg for religious and geographical conflict in the middle east. This review sets the movie to be very dramatic because the story line behind the movie is based on one insult. It shows how humans blow things out of proportion, how we tend to hold on to grudges that later turn into hatred. The film is set to teach us that if we would simply let go of unimportant arguments our society wouldn’t have to deal with unnecessary problems. Nice review. The Insult is definitely an amazing and moving film. It uses tribal grudges, personal pain, and political tragedies in intricate layers to tell a story . . . a story about how a personal insult between two individuals of different backgrounds ignites an escalating altercation involving verbal, then physical attack, and ultimately brief mass skirmishes between Lebanese Christians and Palestinian Muslims in Beirut. I feel something that could have been more easily settled through private negotiation becomes a public stage expressing long-standing and deep-seated cultural and personal rage and anguish. What seems at first to be an unnecessary exaggeration of a fight between two individuals reveals itself ultimately as a metaphor for understanding many larger tensions in the Middle East.The ending eloquently provided a fine closure that avoided being heavy-handed or overly sentimental. Diana Diaz I totally agree with you that the film The Insult really shows us that hate definitely can get out control really quick. I watched the trailer and the movie seemed very intense and suspenseful. With the bit of parts that I saw of the film I also think that the actors did a very good job because it’s seems so real. I think it’s interesting how they made such a simple problem that could have a very simple solution into such a drastic thing that can make you or break you. I like how you compared the United States court system and the Lebanese court system because it gives us an insight on the difference between them and the United States court system seems like it’s a pain.